Seribu Islands Regency, Husein Murad together with local residents and figures conducted Eid al-Adha 1439 Hijr prayer at Al-Makmuriya Mosque, Pramuka Island, Wednesday (8/22).
" We hope it can keep increasing next year"
Total 28 sacrificial animals from local government and residents were slaughtered in that island. 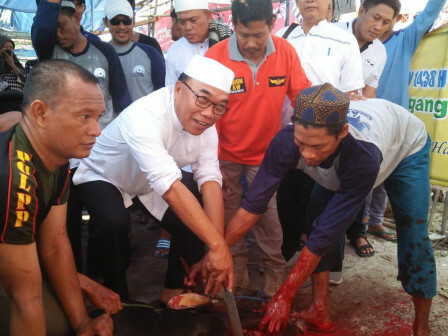 "Today, we have conducted Eid al-Adha prayer at Al-Makmuriya Mosque together with local public figures then it will be continued with sacrificial animal slaughtering," he stated at Pramuka Island. He conveyed his grateful since this year, number of sacrificial animal in Seribu Islands is increased, both cows, goats, and sheep. "Of course it is a good news. We hope it can keep increasing next year," he mentioned. There are 28 sacrificial animals in Pramuka Islands this year, consist of 11 cows, 9 goats, and 8 sheep.